The power of G Suite (and especially G Suite for Education) is undeniable. This versatile cloud-based platform is full of easy-to-use document creation tools, organizational resources, and a myriad of ways to support the Four Cs. The Google team is highly dedicated to its educational offerings, so it’s no surprise that new features and updates are a consistent part of our user experience. But with all these great new tricks and tools comes the sometimes daunting task of keeping up! We tend to keep doing what we’ve always done, which can lead to missing out on an even better way of creating, organizing, and collaborating. With this in mind, one of my first suggestions to stay abreast of fun new features is to subscribe to the G Suite Updates Blog. Here you can follow the official G Suite team feed for the very latest updates and improvements for all things G Suite. In addition, you can get the latest G Suite for Education news here. But what about those cool features that may not be hot off the press, yet are equally amazing and just haven’t hit your radar yet? We’re here to help! 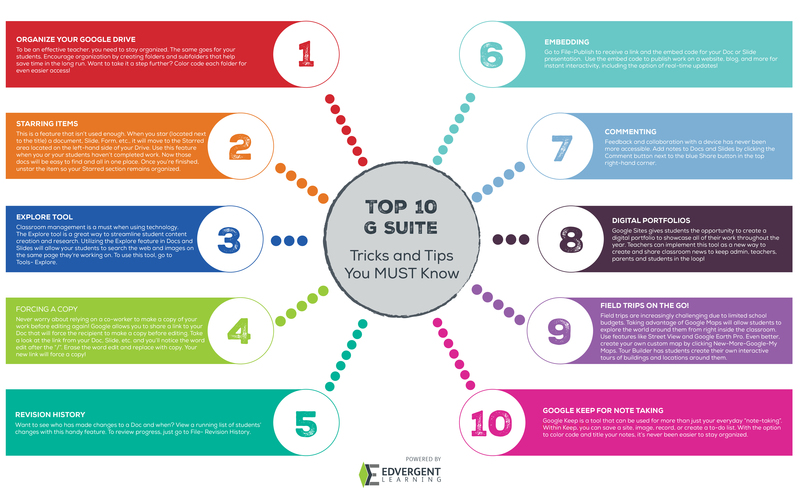 Check out our infographic containing the Top 10 G Suite Tricks and Tips You MUST Know. We’d love to hear your Top 10 list! Be sure to comment below or give us a shout out @Edvergent and #iTeachDigital.